Deleyaman was founded in 2000 by the american multi-instrumentalist of greek-armenian origins Aret Madilian originally from Los Angeles now living in Normandy, France. The three other members are Beatrice Valantin (voice & keyboards) , Gerard Madilian (duduk) and Guillaume Leprevost (bass). Deleyaman’s musical influences are vast. From post-punk to Anatolian psychedelia, from dark wave to art-rock, from post-rock to atmospheric minimalism, their enigmatic sound transcends mainstream genres. The band members of Deleyaman don’t pay much attention to trends. They follow their own creative path off the beaten tracks. They’ve released seven albums to date and continue to create a timeless music, defying the narrow vision of single genres. Deleyaman’s latest album “The lover, The stars & The citadel” was released on November 18, 2016 on TTO Records. The album was recorded at Kurna Hata, the band’s studio in Normandy, France and includes contributions from Brendan Perry of Dead Can Dance, guesting on two of the album’s tracks. The CD format of the album was released on November 2016. A limited vinyl edition was released in April 2017. In the fall of 2000 the band then consisting of Gerard Madilian (duduk) and Beatrice Valantin (vocals) alongside Aret, recorded what was to become their debut album in Aret Madilian’s home-studio in Normandy, France where Aret had moved from Los Angeles. The album entitled 00/1 was released in September 11, 2001 on TTO Records in the U.S. and on a french music label Editions Nech for Europe. Though it went largely unnoticed, except within the french underground music scene, it was a ground-breaking album in its own right. The album was entirely sang by Aret and Beatrice in literary armenian, inspired by the ancient existential poetry of minstrels. Gerard integrated a 3000 year old caucasian wind instrument called the duduk into most of the album’s tracks alongside synthesizers, sampled instruments, bass, percussions and yet it avoided being labeled as world music at a time when anything non-western was being classified as such. The following albums entitled Second and 3 which were released in 2003 and 2006 by the parisian music label Editions Nech, further confirmed the band’s uncommon music. Beatrice who’d sang the background vocals of the first album naturally became the front woman of Deleyaman sharing the vocal duties with Aret. Gerard’s unique duduk playing, Aret’s deep and soothing timbre and Beatrice’s ethereal vocals which were sang and recorded as introspective incantations gave these albums their dark, somber tone. Furthermore, both albums introduced tracks sung in english and other languages. (ex: swedish, turkish, armenian). The sampled rhythms of the first album were replaced by a swedish woman drummer, Mia Bjorlingsson, who’d joined the line-up. Both albums included tracks with Aret making use of anatolian instruments such as the saz, the oud and the def. Between 2005 and 2007 Deleyaman performed live in small venues in Paris and they were regulars at an off the wall club located in the parisian suburb of Pantin called La Menuiserie. Following the release of their third album 3, Deleyaman was invited to tour Armenia in 2007 by the Naregatsi Art Institute. A non-profit cultural foundation for the arts whose main man Nareg Hartounian had been a fan of the band. The same art foundation helped organize Deleyaman’s first tour in California in 2008. In 2009 the band signed with the portuguese label Equilibrium Music in Europe, a label specializing in dark folk, ambient and industrial music and released Fourth, part one. The album revealed a subtle shift in direction for the band. The tracks on the album were mainly sung in english with the exception of three songs sung in french and in armenian. The lyrics were for the most part borrowed from transcendentalist and beatnik american poets. The band also collaborated with french-american guitarist Ara Duzian who was invited to record two tracks on the album but the sound of the band remained centered around the male and female voices of Aret, Beatrice and the duduk of Gerard. Nils Valdes a graphic designer joined the ranks taking on the full time duties of designing the band’s album artwork and projecting videos during live concerts. The more notable gigs of this period were at a venue called DePiek in Vlissingen and a concert featuring Arcana, Deleyaman and Fairydae at the St. Stevenskerk cathedral in Nijmegen, both in the Netherlands in June of 2010. The following album Fourth, part two was released in 2011 on Equilibrium Music in Europe and TTO Records in the U.S.. The subtle changes hinted on the previous release took on further form on Fourth, part two . Synthesizers and string arrangements gave way to the pearly guitars of Ara Duzian who’d joined Deleyaman for these recordings, before leaving the band in June 2011.
in 2011, Deleyaman announced a series of concerts which were performed In April and May of 2012. The band played eight shows in venues and theaters across Los Angeles and a show at the Orange County Center for Contemporary Art in Santa Ana, California. Following these series of gigs, Deleyaman returned to Europe to start the recording sessions of a new album. in March 2013, the band returned briefly to the U.S. and played in the cities of Portland, San Francisco, Oakland, Berkeley, Long Beach, Los Angeles and Santa Ana as a duo. These shows were performed with Aret Madilian on guitar, bass, keyboards, vocals, Beatrice Valantin on keyboards, vocals alongside sequenced drum tracks. Following its release, Deleyaman performed a very few shows in northern and southern California. In 2015, drummer Mia Bjorlingsson left the band having moved to the Netherlands. In autumn 2015, Deleyaman began the recordings of The lover, The stars & The citadel. The album was recorded between October 2015 and June 2016 at Kurna Hata, the band’s studio in Normandy. 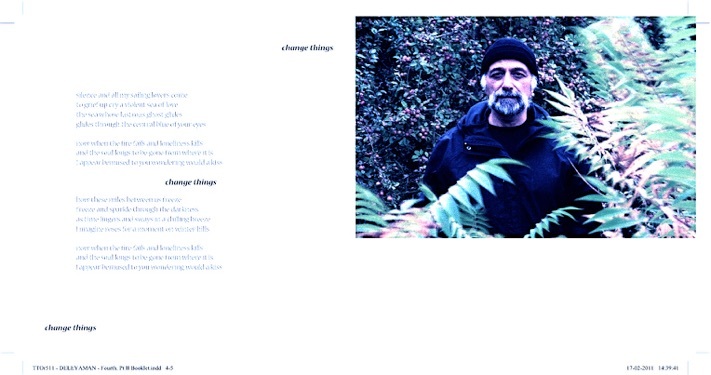 It includes contributions from band friend Brendan Perry of Dead Can Dance, guesting on two of the album’s tracks. The CD format of the album was released on November 2016. A limited vinyl edition was released in April 2017. In 2017, The french nouvelle vague actress and director Fanny Ardant included two tracks from Deleyaman’s Second album on the soundtrack of her latest film Le Divan de Staline. An adaptation of Jean-Daniel Baltassat’s novel. *2018 - Guillaume Leprevost former bass player of the french band Nellcote joined Deleyaman, taking on bass and guitar duties. *October 2018 - Deleyaman & Jules Maxwell toured Ireland and the UK playing in Limerick, Galway, Lisdoonvarna, Carlow, Dublin, Dundalk and Portaferry as well as doing an instore performance at Bending Sound Records in Bangor and guesting on BBC Radio Ulster’s John Toal show. Currently in the studio Deleyaman will be releasing their new album in autumn 2019. Dates will be announced soon.